FOLIO Sutton Coldfield is delighted to announce a new monthly event in Sutton Coldfield Library; on the third Wednesday of every month FOLIO will be facilitating a Family History Help Desk, with support from a genealogy expert with more than 30 years experience helping others research their families in the West Midlands and across the UK. The free sessions, for which booking is recommended to guarantee a slot with our expert, have been set up by FOLIO following local consultation about the type of activities Sutton residents would like to see take place in our public libraries. Support and help with family history research has been one of the most frequently suggested activities and as such FOLIO is delighted to be able to make this happen. The first help desk will be on May 16, from 1-3pm and booking is already open. 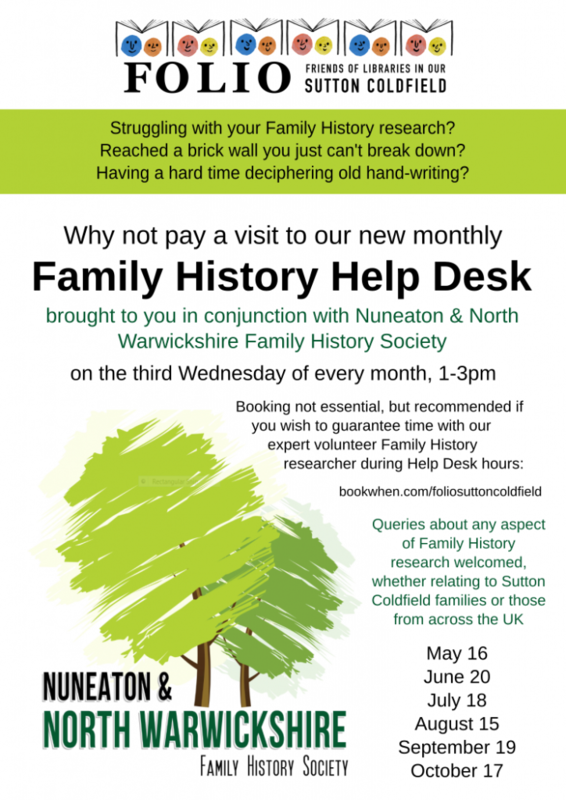 Queries about any aspect of family history research will be welcomed, whether relating to Sutton Coldfield families or those from across the UK. ← Community groups come together to create a cake crawl!